"Rum and butter...mmm. A smooth and softly sweet peach pie with lots of layers of distinctive flavor. An original recipe of mine which is the favorite fruit pie in our house." Preheat oven to 400 degrees F (200 degrees C). Lightly grease a 9-inch pie dish with butter. Press one pie crust into the prepared pie dish. Mix sugar, flour, cornstarch, cinnamon, cardamom, and allspice together in a bowl. Slowly stir butter into the sugar mixture until fully incorporated. Toss peaches and rum together in a separate bowl; add sugar mixture to peaches. Gently toss to coat peaches. Pour peach mixture into pie crust. Top with remaining pie crust; seal the two crust edges together. Cut 4 to 5 slits in the top crust for ventilation. Brush with milk. Bake in the preheated oven for 15 minutes. Lower heat to 350 degrees F (175 degrees C); bake until top is golden brown, about 30 more minutes. Turn off the oven and let the pie rest in the oven as it cools, at least 1 hour. I used 10 peaches, 2 Oz. spiced rum and everything else was as per recipe. This pie was excellent, fast and easy. Just my style. thank you. 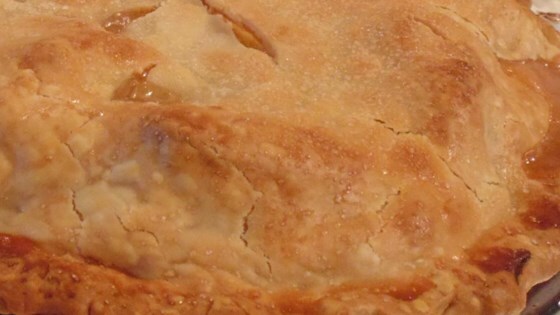 This recipe makes a delicious & beautiful peach pie! I will make it again, but will probably use a little more sugar than the recipe calls for. My family likes it real sweet.